“There is nothing new except what has been forgotten,” observed Marie Antoinette. Many such forgotten things that have become new and popular once more in our day: rye whiskey, ripped denim, vinyl records, and calligraphy come to mind. 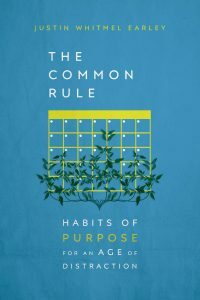 Now we can add to that list the concept of a rule of life, with the growing popularity of Justin Earley’s “Common Rule” movement, which now includes his book, The Common Rule: Habits of Purpose for an Age of Distraction. Like many rediscoveries of the old, The Common Rule and its new rule of life offers much that is good, some that is confused, and some that might best be characterized as a corruption of the original. First the good. Earley’s rule is an attempt to refashion one’s life around a core group of four daily and four weekly habits. The genesis of this program is found in the author’s own personal experiences as a missionary in China and then as a Georgetown-educated attorney practicing in Richmond, Virginia. A devout evangelical serious about orienting his life around God, Earley early in his legal career found himself overwhelmed by his professional responsibilities—so much so that his life became increasingly reliant on alcohol and sleeping pills to fall asleep and self-medicate. It was in this dark hour that he discovered the power of habit. Earley realized what wise men and women—often those of a hermetic religious or philosophic disposition—discovered millennia ago: that our habits are incredibly potent forces in determining the trajectory (and success) of our lives. The most successful people across any profession—be it law, business, politics, writing, or athletics—are typically those with exemplary habits and self-regulation. Moreover, our habits also impact our intellectual, emotional, relational, and spiritual lives. For example, maintaining a habit of being connected to technological devices fosters a state of unending busyness, which usually results in anxiety, exhaustion, depression, and one of our newest maladies, FOMO (“fear of missing out”). The habit of always eating meals while working or being on an electronic device fosters isolation, disconnectedness, and an inability to relax and “be present,” either with oneself or with others. The solution, according to Earley, is to incorporate daily and weekly habits into one’s life in order to inculcate deeper fellowship with God and neighbor; to embrace the good things of God’s creation; and to resist the forces of evil and suffering in the world. These daily habits are prayer three times per day; one meal with others; one hour with the phone off; and beginning the day with Scripture rather than one’s phone. The weekly habits are one substantive conversation with a friend; limiting media consumption to four hours per week; fasting from something for one day; and practicing one day of Sabbath, or intentional rest. All of these practices are good and to be praised. Indeed, all of them are inherently ordered to a proper telos, be it God, neighbor, or human flourishing. Evangelicals, to whom this book is directed, will surely benefit from adopting any (or all) of these habits into their lives, and in their practice will discover far deeper levels of spiritual, emotional, and intellectual well-being. Many might note, however, that there are already deep, long-standing traditions within various Christian communities that promote these very habits. I spent about seven years of my life as a Presbyterian, which included completing almost half of a seminary degree. The Reformed tradition, and certainly the denomination of which I was a part, encouraged many of the above habits, if not in an explicit, detailed rule of life. The Anglican tradition offers much the same (and to a far greater degree), while there are even Protestant communities that embrace various degrees of monasticism and hermeticism. Moreover, the Catholic and Orthodox traditions possess rules of life that have been practiced since the early centuries of Christianity. Earley is not ignorant of this reality. He cites, albeit in passing, the Benedictine and Augustinian rules as early exemplars of what he is promoting. From a Catholic perspective, though, this is really only one manifestation of a larger liturgical life in which all the faithful are encouraged, if not mandated to participate. Many of these practices predate the Reformation and can even be traced to the first generations of the church. For example, the Liturgy of the Hours, also known as the Divine Office, has its origin in the New Testament (Acts 2:23-30), while many documents (e.g. the Didache, c. 100 A.D.) and writings of the Church Fathers (e.g. Clement of Alexandria, Tertullian, Origen) make note of an organized routine of prayer and Scripture reading in the life of the early Church. Today, every day, lay Catholics and religious around the world read the same Scripture passages and say the same prayers as their fellow members of the universal Church. The Angelus, or midday prayer of the Church, has been in use since at least the Medieval period. Organized fasting also has ancient origins—the Didache demonstrates Christians fasted on Wednesdays and Fridays, a tradition many still observe with the Friday fast and/or abstention. Some Catholics fast on both Wednesdays and Fridays in honor of this ancient tradition. Moreover, fasting during Advent, Lent, and on other days is just as old, and was once even more severe than that of Islamic Ramadan! Common meals have been and continue to be an important aspect of monastic life, and are something many Christian families still prioritize. Food’s spiritual and communal nature is further visible in the Catholic traditions of performing the sign of the cross and praying before and after the meal (the latter featuring a prayer for the faithful departed). Of course, there is no mandate in Catholicism or Orthodoxy that people eat meals together, or that they abstain from technology in the disciplined manner outlined by Earley. Yet this almost certainly is related to the fact that not eating together and being addicted to technological devices are relatively new phenomena. All this to say that while there’s nothing inherently wrong about the kinds of things The Common Rule encourages, it reads as a text largely ignorant of what already exists—and indeed, has always existed—in the Christian tradition. Earley makes much of the importance of habit, yet never references Thomas Aquinas, whose treatment of habits, and their intimate relationship with virtuous behavior, is foundational to the Christian understanding of the subject. This is perhaps excusable in a book directed at low-church evangelicals who might be uninterested or confused by references to ancient ecclesial texts or Doctors of the Church. But it also reflects a deeper problem, what Russell Kirk called “the dissidence of dissent,” and has also been called private judgment, to borrow a phrase from Anglican convert to Catholicism Blessed John Henry Newman. A person who makes his own ego the ultimate norm of his religious beliefs and practice can obviously not feel at ease in a church that holds to any objective criterion. The church, however, that he himself founds will soon become far more oppressive for other people, being based on his particular brand of subjectivism. This is the reason for the ceaseless multiplication of Protestant sects, which, once started, gathers speed, since each new foundation is as a rule established on a narrower base than its predecessor. “Please,” the reader may respond, “Earley is hardly creating a new church or new religious sect. He is simply creating and promoting a new rule of life, a system of practices that can be applied by Christians of any theological or denominational persuasion.” This is true, and certainly he has no intention of creating some new religious tradition centered around his own ego—he is a man who wants to help other Christians grow and flourish. Yet, however good his intentions, creating a new tradition around his own person is effectively what he does—indeed, all he can do so long as he remains in this paradigm of “every man a pope unto himself.” This problem is especially salient in his creating a new “liturgy,” which is exactly how he describes habits. This is symptomatic of the more essential problem with The Common Rule—it is an extension of the paradigm of private judgment. Earley’s rule ultimately reflects his own religious judgments—judgments not only about forming good habits (which are more-or-less harmless and benign), but also judgments about the interpretation of Scripture and the nature and form of liturgy. Untethered from any objective ecclesial tradition, Earley is free to borrow and recast as he sees fit. We see these language games at play when Earley defines liturgy as “a pattern of words or actions repeated regularly as a way of worship.” This is however a definition of the word “ritual,” not liturgy. The liturgy of the Church, alternatively, is borrowed from the Greek word leitourgia, literally meaning “work of the people.” In its pagan context, this term signified expensive offerings that wealthy Greeks made in service to the people and thus to the polis. The Church in turn adopted “liturgy” to mean the public work of the Church for God’s sake, including its prayer, especially participation in the Church’s highest prayer, the celebration of the Eucharist. Thus to participate in the Church’s liturgy—Mass, the Divine Office, or any other liturgical function—is to engage in essentially public ecclesial acts oriented toward God, acts which originate from the organic practice of the universal, apostolic Church. The locus of Earley’s liturgy, alternatively, is his own private judgment about what constitutes right worship. Its practice in turn is individualistic and subjective, even if The Common Rule promotes communalism. Readers may still ask what harm will be done by The Common Rule. Surely it will do good for Christians to embrace its daily and weekly habits? For individual evangelicals who apply its methods, this may very well be true. Yet ours is a time of increased atomization and splintering, and this has had its effect on the American evangelical community. Between 2000 and 2016, the number of Protestants who identity as non-denominational doubled, while one in six Americans consider themselves non-denominational. Millennials meanwhile are leaving organized religion, including evangelicalism, in droves. Large cohorts of Americans seem uninterested in historical, organized forms of Christianity, preferring a more subjective, individualized form of faith that meshes well with a certain stream of American identity that is fiercely independent. This is only one step away from abandoning Christianity, or anything resembling historic, orthodox Christianity, altogether. Is a Richmond-based lawyer fashioning his own “liturgy” symptomatic of this trend, or a rearguard action that will blunt its power? I’d argue the former—as long as recovery is dependent on the individual Christian’s judgment, rather than union with the universal Church, it ultimately contributes to the fragmentation, no matter how well intentioned.